Situated off a small island called Koh Klum is Hin Rap. 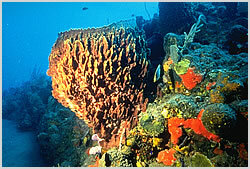 Comprising of a rocky reef covered in barrel sponges with crowded shelves of soft corals and gorgonians. There are many small reef fish at this dive such as anthias, gobys and fusiliers.